Above is a chart showing how the CRSP US Total Market Index is broken down. CRSP categorizes companies into Mega-cap, Large-cap, Mid-cap, Small-cap, and Micro-cap by cumulative market capitalization, as opposed to a fixed number or a set number of stocks. 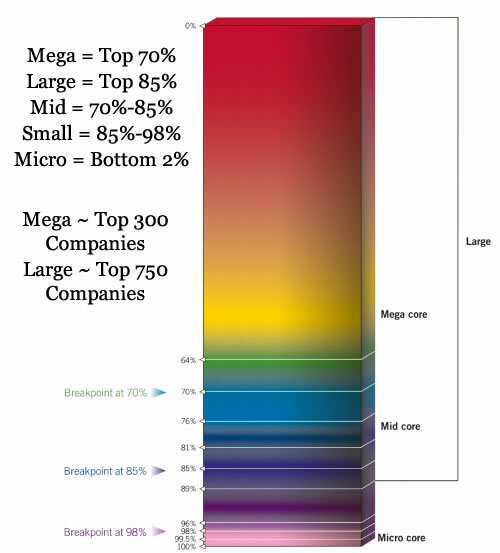 For example, “Mega cap” companies are those in the top 70% of cumulative market cap. This works out to roughly the 300 largest companies, or the companies worth more than about $2.6 billion. Note that CRSP defines “Large cap” stocks as the combination of “Mega” and “Mid” cap stocks, which can be a bit confusing. This also means that the top 700 or so stocks make up 85% of the fund, while the bottom 3,000 or so make up only 15% of the fund. The big corporations are really big. The top 10 holdings alone make up 15% of the fund. Some people may view this as a negative, but it also tends to reflect their relative impact on the economy. Another benefit that results from all this is minimal trading and thus very little turnover. If a company rises (or drops) in value, then with market-cap weighting it should be a larger (or smaller) part of the portfolio and there is no need to buy or sell any shares. Since you own the whole haystack, you don’t even have to worry about a company going from “large-cap” to “mid-cap” or vice-versa. This means the fund is very tax-efficient and distributes very little taxable capital gains. 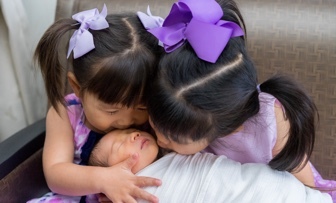 In a taxable account, this improves your after-tax returns and lets compounding do its thing. 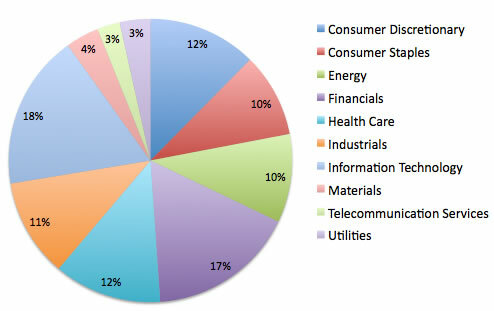 Here is the overall breakdown of VTSMX holdings by sector, as 3/31/2013. As of 4/12/2013, the annual expense ratio of both the ETF (no minimum) and Admiral share classes ($10,000 minimum) of the Vanguard Total Stock Market Index Fund is just 0.05%. So for every $10,000 invested, Vanguard charges a total of just $5 a year to manage this basket of stocks. There is no way an individual could replicate the underlying holding themselves for such a price. The Investor class shares have an expense ratio of 0.17%. Specifically, these fund expenses are taken out of the fund’s net asset value (NAV) a tiny bit each day (fractions of a penny per share). By representing the entire US stock market in a complete, efficient, and low-cost manner, the Vanguard Total Stock Market Index Fund is the epitome of a “core” portfolio holding. Owning a competing index fund that also tracks a broad US index using market-cap weighting with a similarly low expense ratio will likely give you similar results. However, I give a slight preference to Vanguard due to (1) their “at-cost” client-ownership structure helps to ensure that costs will stay low, and (2) their experience and skill at indexing. Disclosures: VSTMX/VTSAX/VTI is a cornerstone of my portfolio, and I expect it to stay that way for the foreseeable future. You’ve an extra zero in your Apple return percentage. It appears that Vanguard’s index switch (a witty boglehead forum poster accused Vanguard of actively managing their indexes, LOL) is mainly driven by index licensing costs. I can understand paying to license a more complicated index like foreign markets, emerging, specialized sectors, etc. But why would you need to pay for an index for something so trivial such as a market cap breakdown? Why don’t brokerages just call it a generic “Top 70% U.S. Market Cap fund” and pay no licensing fees, period? Just bought my first Vanguard index fund (VFINX) in a traditional IRA to get a bit of a break on this years taxes, as well as, start saving for retirement. What I’m left wondering is if I made the best choice in fund based strictly on the basis that it is around an all time high. I’ve heard some say this a non-issue for a long term investor, but still wonder if I should move it into something else before I start taking a hit. @Tony: No, if you’re a long term investor, you should leave it in VFINX. If you start trying to guess which sector is going to going to be the next hot one, then you’re playing stock market games. You could win, you could lose. For all anyone knows, VFINX/S&P500 could keep going up from here and never ever come back down to this level. Case in point, in 1995, the S&P500 hit its all time high. After that, it kept going up and up. Even during the crashes of 2001 and 2008, S&P500 never dropped below 1995 levels. @Tony – What @Bucky said… if you really knew what was coming up, you could do something. But you don’t. I don’t. Buffett don’t. As long as your horizon is long, just relax and you’ll be fine. If the S&P 500 is at 1600 today, do you really care if you bought in at 450 or 500 long long ago? It’s at an all time high up to the present day — do you know if it’s at an all time high when looking 50 years into the future? No, and no one does. All the “all time high” tells you is how it’s done in the past — but the past is over, and it tells you nothing about how it’s going to perform in the future. I’m nearing retirement and just now asking the question “am I investing my money in a way that benefits me or the financial adviser who has my money?” I’ve wondered about Vanguard but, from what the fees look like, I could just give my money to a ‘fee only’ adviser and do just as well don’t you think? I am a 80 year person I don”t need money for my livings expences that all ok, I sold some property a few months ago,and would like some funds monthly to spend on the kids and grandkids. we have a few hundred thousand to invest, looking at your posts, and looking at Kiplingers posts, I get a little confused on the leters on the Index funds of vandguards funds, the artical talked about 5 index funds. I would like to invest in funds, and take most of the gain out monthly.